Since 1985 we have been delivering optical ray tracers to the engineering and education communities. Our new open source policy makes the entire set of BEAM FOUR project source files public, under the GNU General Public License Version 2. The source code and full documentation can be downloaded from GitHub. Release 208 includes all the features of our previous releases: Multiple on-screen layouts with various views and scales that give you a variety of views of your optical system. Maps were added last year: these are color coded diagrams showing how your image quality varies over your field, or over a 2D parameter space. Combined with our MultiPlot feature -- which delivers a grid of spot diagrams -- you can explore how your design is influenced by the available parameter choices. Also included (starting back with release 128) are Gaussian scattering surfaces that let you distribute and monitor the delivered light intensity using the 2D histogram function. New since release 168 is a much-improved coordinate break function that permits easier analysis of bent optical paths and tolerancing of angles and offsets, and an improved Map display capability, like last year's, but now with complete text file output. Also newly formulated are transmission gratings: uniformly ruled, varied-line-space, and HOE ruled in both surface and volume phase holographic (VPH) technology. Here's a very quick look at the variety of optical systems that BEAM FOUR JAVA EDITION handles: a crossed Czerny-Turner spectrometer is to be set up to give good grating clearances over a specified range of wavelengths, without vignetting, while preserving good spectroscopic resolution. How to do this, and meet requirements? BEAM FOUR shows you every portion of the system and lets you edit rays, surfaces, and wavelengths to deliver the necessary image fields. With the advent of Java as a cross-platform application development language it's practical to create software tools that pretty much run anywhere. Our BEAM FOUR JAVA EDITION, initially released in 2009, is the culmination of our efforts to combine the most needed features of our product lines into one high value run-anywhere application. 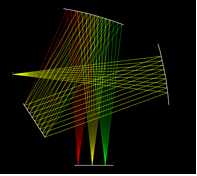 Another example: a Cassegrain telescope is to be modelled but it has a spider blocking some of the entrance pupil. Spot diagrams and image quality statistics are needed. Start with a detailed layout, as shown, and continue on to get the spot diagrams and image statistics. So: welcome to our website. Here you will find product specifications, owners manual views, tech notes, the free download package that includes the runnable software, example files and the Users Guide. Review our brief two-page description of Beam Four Java Edition. Your Java run-time will respond with something like "1.8.0_20". Then close your command window. If you are running an older version of Java, it is time to update that to the newer secure version. LINUX users: most distros require that you set the .jar file properties to make it runnable. To do this, right click the .jar icon, choose Properties/General "Open with JDK" and if available "Set as Default." Then on Permissions tab, click "Make the file executable."